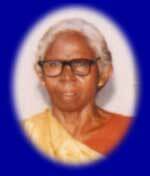 I am Kanthamma an Adivasi from a village called Narsagunta. I am a widow. My husband died due to snake bite 4 years ago. I work as a daily labourer to feed my children. All the villagers work as daily labourers in our village. Our children never went to schools. We have never seen a doctor coming to our village. We live in small huts. 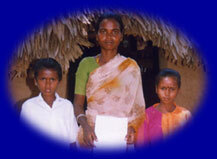 COREED came to our village in the year 1992 and changed our lives. Children are going to schools that coreed has established for us. COREED doctors visit us once in 15 days to give medicines. They helped us to have electricity and houses by the government ( under construction). My children are going to school and are studying. I want my children to study and to live on their own without working like me. I thank COREED for helping my family and our village. My name is Pichamma. I am an Adivasi. I am from a village called Vikintapuram. I lost my husband while my 4 children were infants. He died because he drank arrack. I work as a daily labourer. By the time COREED came into our village in 1989 my children are grown and scattered in different places to work for their livelihood. My daughter was small and she studied in COREED and now she is working as a teacher in the COREED Rural Free Study Center. COREED made possible to build houses, electricity, roads and toilets in our village. All our children go to COREED school for education. DCOREED doctors visit us and give us medicines. I suffered as tuberculosis patient for long time. COREED helped me with good medicine and food. Now I am doing fine and I am also working as Aya in our village for COREED children. I thank COREED for helping me and our village. My name is Jeevan. I am Dalit. My parents are handicapped. 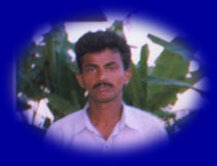 I studied in COREED George Technical Institute and continued in Free Polytechnic Coaching held in 1996. I have completed Polytechnic course from government college with the subject called electricals and tele communications. I am now earning my lively hood with the skill I have learnt and helping my parents. I am married and blessed with one child. I am always thankful to COREED for shaping my life. My name is Ademma. I am an Adivasi. I am from a village called Adi Reddy Colony. COREED has changed our lives. COREED started their work in our village in 1987 with Summer Free Tutorial Institutes and subsequently they have started regular school, Medical work, Seminars and Women Development centers. Women are empowered with various kinds of skills and we are now earning our livelihood. Our husbands stopped violence and they are good to us. COREED made possible to build houses, well,electricity, school and community center in our village with the help of the government. We are always grateful to COREED for helping us and our village. We are from the village called Mocharla a Dalit village. COREED commenced it's educational, medical and other developmental works in our village in the year 1987. Today we all are blessed with their works. Our girl children who never go to schools are going to schools and are entering into high schools and colleges for higher studies. COREED has helped our village to develop in various ways. We thank COREED for helping us. My name is Venkateshwarlu. I am daily labourer. I am an Adivasi from a village called Sainna Gunta. COREED is helping our children to get education and medical help. My wife who was pregnant suffered while giving birth to my twin children. COREED doctors took us to hospital in town and saved my wife and children. Now I am sending my children to the coreed school in our village. I thank COREED for helping us in critical conditions. My name is Venkamma. I am a Dalit from a village called Kummari Palem. I work as daily labourer. My husband is a chronicle patient. I work to feed my husband. I suffered with cataract. I am almost blind and was unable to see. No one wants me to work in their fields and hence we suffered for food. I have decided to go to the roads to beg for our living. God has sent COREED eye doctor to our village and treated me in town hospital. Now I am able to see. I have new spectacles. I am able to continue to earn my livelihood. I am also a member in COREED Women Groups in our village. I thank COREED for helping me. 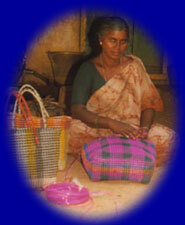 We are COREED Women Group members from an Adivasi village called Potluru. COREED commence it's educational, medical and social activities in our village in the year 1992. 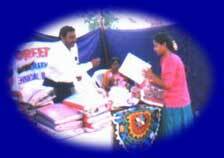 Last year they have started Women Development Center in our village and helped many of our women to be benifited. Today we have learnt skill works like sewing and hand works. These skills have helped us to earn our livelihood in our house without going out and facing atrocities. We are now saving some money and taking the same as loan from our group. Our needs are met. We are motivated regularly with various kinds of seminars by COREED. We all as a village thank COREED for helping us. My name is Ramanamma from a Dalit village called Musunuru. COREED educational and medical activities started in our village since 1992. I studied in COREED Rural Free Study Center upto 10th class. In the year 2000 I have joined in COREED George Technical Institute for Tailoring course. I studied for one year and completed the course. Today I am working in garments manufacturing company and earning Rs.1300 and helping my old aged parents. I always feel I am privileged to be a student of COREED. Many of my classmates have also are given jobs in garments manufacturing units and are earning their livelihood. I thank COREED for helping poor people like me.